VANCOUVER, BRITISH COLUMBIA--(Marketwire - Sept. 11, 2012) - GoldQuest Mining Corp. (TSX VENTURE:GQC)(FRANKFURT:M1W)(BERLIN:M1W) ("GoldQuest" or the "Company") is pleased to announce that a drill rig capable of drilling to approximately 700 metres has started drilling at the Company's Romero Discovery in the Dominican Republic. The Romero mineralization is located within the Company's 100% owned Las Tres Palmas Project in the Dominican Republic, where the discovery hole was announced on May 23, 2012, and highlights include 231 metres grading 2.4 g/t gold and 0.44 % copper (see release of May 29, 2012). 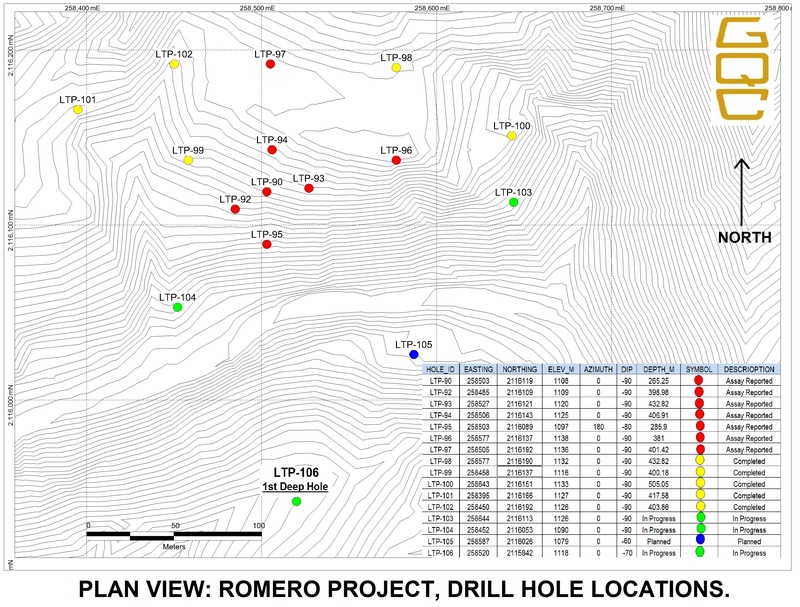 As of today's date, twelve holes have been completed at the Romero discovery zone and three more holes are in progress (see map for location and length of holes at http://www.goldquestcorp.com/images/maps/2012-09-10_MAP3.jpg). Thus far, the assays for seven holes have been reported and all these seven ended in mineralization, which, in the opinion of the Company, warrants the use of a larger drill rig capable of investigating deeper mineralization potential. "We look forward to using this drill rig to investigate the Romero discovery and surrounding targets at depth." commented Julio Espaillat, GoldQuest's CEO "This machine will also be deployed to drill inclined holes into areas of known mineralization to gain further understanding of the mineralization and structure in three dimensions." In other news, the Company is also pleased to announce the appointment of Jeremy Niemi (P.Geo) as Director of Technical Services and Compliance. Mr. Niemi has over 15 years experience in the resource industry from mineral exploration through to mine development and production. Recent positions include VP Exploration for Noront Resources and Manager, Technical Services, for Kinross Gold Corporation. "We are pleased to welcome Mr. Niemi to the Company," commented Julio Espaillat, "as he brings wide experience to the Company, especially in terms of resource modeling. Jeremy's experience will be helpful in assisting the Company with its rapidly expanding operations." The Company has granted incentive stock options to an employee of the Company to purchase up to 250,000 common shares of the Company at a price of $1.56 per share. The stock options are exercisable on or before September 4, 2017 and vest in stages with 25% to vest immediately and the remainder to vest 25% at three, nine and fifteen months from the date of the grant. The stock options are being granted pursuant to the terms of the Company's stock option plan and are subject to regulatory approval. GoldQuest is a Canadian based mineral exploration company with projects in the Dominican Republic traded on the TSX-V under the symbol GQC.V and in Frankfurt/Berlin with symbol M1W, with 142,496,933 shares outstanding (154,856,567 on a fully diluted basis). This news release contains certain statements that may be deemed "forward-looking statements". All statements in this release, other than statements of historical fact, that address events or developments that GoldQuest expects to occur, are forward- looking statements. Forward looking statements are statements that are not historical facts and are generally, but not always, identified by the words "expects", "plans", "anticipates", "believes", "intends", "estimates", "projects", "potential" and similar expressions, or that events or conditions "will", "would", "may", "could" or "should" occur. Although GoldQuest believes the expectations expressed in such forward-looking statements are based on reasonable assumptions, such statements are not guarantees of future performance and actual results may differ materially from those in forward-looking statements. Factors that could cause the actual results to differ materially from those in forward-looking statements include exploitation and exploration success, continued availability of capital, financing and required resources (such as human resources, equipment and/or other capital resources) and general economic, market or business conditions. Investors are cautioned that any such statements are not guarantees of future performance and actual results or developments may differ materially from those projected in the forward-looking statements. Forward-looking statements are based on the beliefs, estimates and opinions of GoldQuest's management on the date the statements are made. GoldQuest undertakes no obligation to update these forward-looking statements in the event that management's beliefs, estimates or opinions, or other factors, should change, except as required by law.